Custom embroidered Ladies Denim shirts with a flattering look every lady wants. Offered in long and short sleeve. 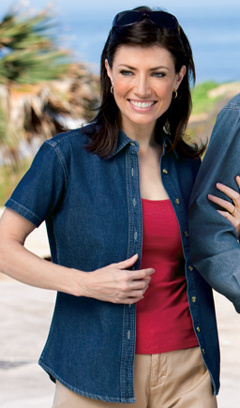 Brands such as Harriton, Port & Company and Port Authority lead the industry in their fine ladies cut denim shirts. Custom embroidered logo included in price. Custom embroidered M550W Harriton Ladies Denim Shirt. 6.5 oz, 100% cotton indigo denim shirts. Signature horn-style buttons with Harriton logo and contrast thread. Signature twill tape at neck. Fully constructed front placket. Inside flat felled seams. Elegant khaki double-needle top-stitching. Custom embroidery included. Custom embroidered LSP10 Ladies Value Denim shirt has sturdy construction, a generous cut and soft garment washing, our Value Denim shirt won't stretch your budget. 6.5-ounce, 100% cotton, Double-needle stitching, Traditional, relaxed look, Open collar, No pocket, Horn-tone buttons, Tuck-in tail, Button-through sleeve plackets and adjustable cuffs, Custom Embroidery Included. Same value denim as above but in a short sleeve version. Custom embroidered LSP11 is of sturdy construction, a generous cut and soft garment washing, our Value Denim shirt won't stretch your budget. 6.5-ounce, 100% cotton, Double-needle stitching, Traditional, relaxed look, Open collar, No pocket, Horn-tone buttons, Tuck-in tail, Custom Embroidery Included.